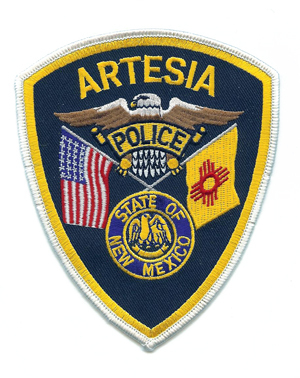 A pair of Artesia men were arrested Sunday and Monday in incidents relating to a DWI accident and an incident of criminal trespassing at Artesia General Hospital. On Sunday, Artesia Police Department officers were dispatched to an area in the vicinity of the 1800 block of West Jacobs Avenue in reference to an individual who had wrecked his vehicle into a home. The man, identified as Christopher Gomez, 24, of Artesia, was being detained by officers when he pushed his way out of a patrol vehicle and tumbled to the ground with an officer who was attempting to secure his seatbelt. Police attempted twice more to place Gomez in the vehicle, and he fought them each time, ending up on the ground. On the fourth attempt, Gomez stopped short of entering the vehicle and had to be pulled in from the other side. He was arrested for aggravated DWI, open container, failure to give immediate notice of an accident, and failure to give information and render aid for wrecking his vehicle into the home, along with an additional charge of resisting, evading or obstructing an officer. Gomez has pleaded no contest to charges of failure to give information or render aid, failure to give immediate notice, and resisting/evading. He is scheduled for a 10 a.m. May 2 sentencing hearing in Artesia Magistrate Court. A preliminary examination is scheduled at that same time on charges of aggravated DWI (first offense), open container, failure to give immediate notice, and leaving the scene of an accident. In the early mornings hours of Monday, officers were dispatched to Artesia General Hospital in reference to a male subject who would not leave the facility despite having no medical issues. The man, identified as Timothy Hoerath, 39, of Artesia, left upon police arrival but returned just after 4 a.m., behaving in a disruptive manner. Officers returned and issued Hoerath a criminal trespass warning, waiting until he had again left the hospital. Hoerath proceeded to return to the AGH emergency room for a third time at 4:30 a.m.
After being escorted outside, Hoerath attempted to evade officers, and a Taser was deployed. Hoerath was able to break the wire and run away but later returned and was taken into custody on charges of criminal trespassing and resisting, evading or obstructing an officer. He appeared for arraignment at 10 a.m. today in Artesia Magistrate Court.